Perhaps the best part about being a geek is that I have a deeper appreciation for many franchises like Star Trek, Star Wars, Doctor Who and others. However, it does become a challenge trying to find time to spend with all of the different geeky things that I love. 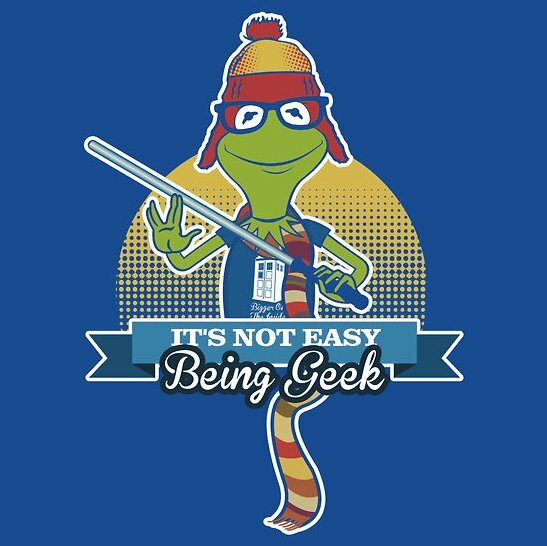 I think that is exactly the message that Kermit the Frog is trying to make in this “It’s Not Easy Being Geek” T-shirt. For the geeks out there that feel the same way and love this awesome shirt, you can order the “It’s Not Easy Being Geek” shirt from Redbubble for $24.54. That is more than I like paying for a t-shirt, but this is pretty awesome! Pass this along to any geeks you know! Like Fanboy Fashion on Facebook too! From the creator of Global Geek News (Jeremy Bray), comes the site dedicated to the things geeks wear, Fanboy Fashion! From the geekiest t-shirts around to the most amazing cosplay you have ever seen, if geeks wear it, we will post it! The content should start flowing almost immediately but for the time being, you can expect 1 post a day (M-F) starting today. Most of the site is ready to go but there might be a few things missing here or there so if something doesn’t seem quite right, don’t be alarmed. If you see something that isn’t right, please feel free to e-mail me with the address listed on the contact page in case I don’t know about the problem. I hope you all enjoy yourself while you are here! Feel free to follow me on twitter until I get a dedicated twitter account set up for the site. Finally, feel free to subscribe to the site with your favorite RSS reader so you don’t miss out on any of the awesome things we will post!